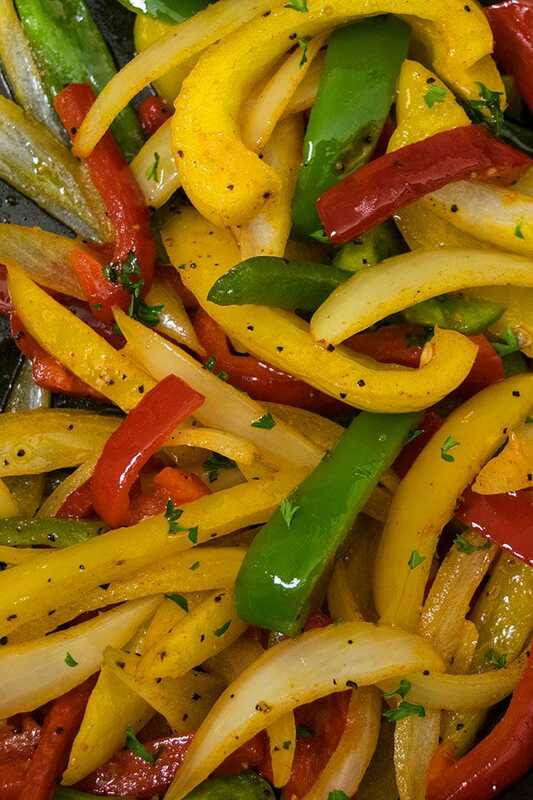 Quick and easy vegetable fajitas recipe, homemade with simple ingredients over stovetop. Loaded with mixed peppers, onions, taco seasoning. A colorful Mexican 20 minute meal or side dish that’s great on tacos, burritos, enchiladas, quesadilla. This is perfect for Taco Tuesday. The veggies are tender yet crisp and packed with flavor. You can serve this with my Chicken Fajitas (One Pan) and these Steak Fajitas (One Pan). How to make vegetable fajitas or fajita vegetables or veggie fajitas? Add garlic, onions, peppers and saute for a few minutes. Mix in taco seasoning, salt, pepper. You can also roast the vegetables in the oven at 400 degrees for 15-20 minutes or until veggies are tender. If weather permits, you can also grill them over medium heat. What sides to serve with with fajitas? Typically, it’s served with hot or soft tacos. Some people also enjoy it with rice and beans or cilantro lime rice or even One Pot Pineapple Rice (especially if you fond of the sweet and spicy flavor combination). 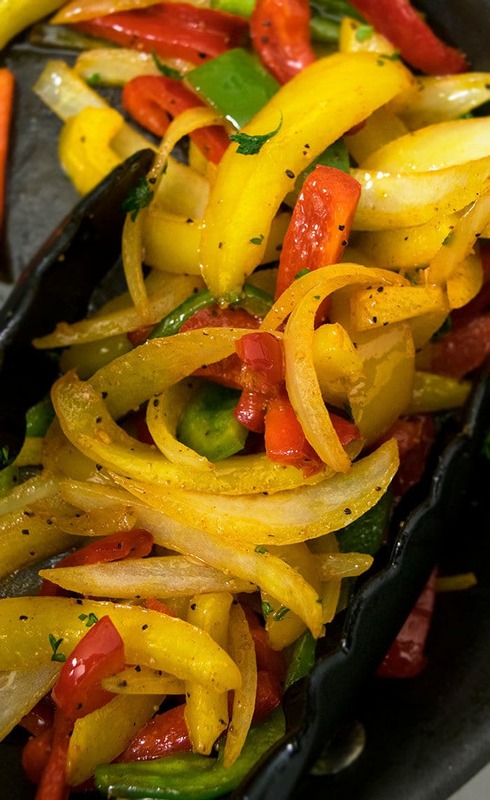 Yes, they are packed with vegetables and stir fried in a little olive oil. What vegetables to use in fajitas? Bell peppers- There are so many options and colors. Use a variety of them. I use green, yellow, red and orange peppers. Garlic- This is not typically used but I always add it because it gives the overall dish so much flavor and aroma. Onions- I use yellow onions but red onions add a lovely color. Cilantro- The best garnish for any Mexican dish. Mushrooms- Not technically a vegetable but add 1 cup thinly sliced mushrooms of your choice. If you will be serving these fajitas to vegans or vegetarians, mushrooms will make it more filling since they can’t eat other proteins like chicken and beef. Use unsalted butter– Because this prevents the meal from becoming too salty. You can also replace butter with oil. Use nonstick pan– Because this prevents sticking and burning. Adjust amount of seasoning- This can be done, based on your preference. Always check the flavors near the end and adjust accordingly. Cut thin slices– Because they cook faster. Veggie fajitas seasoning- Taco is seasoning is best. Store-bought or homemade versions can be used. 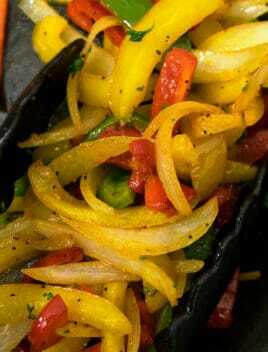 Veggie fajitas marinade– Typically, marinades are used to deepen the flavors in meats like chicken and beef. I really don’t think it’s necessary here because the taco seasoning adds enough flavor. Can you freeze vegetarian fajitas? No, you cannot do this because when they thaw, the vegetables texture changes and they are no longer crisp. 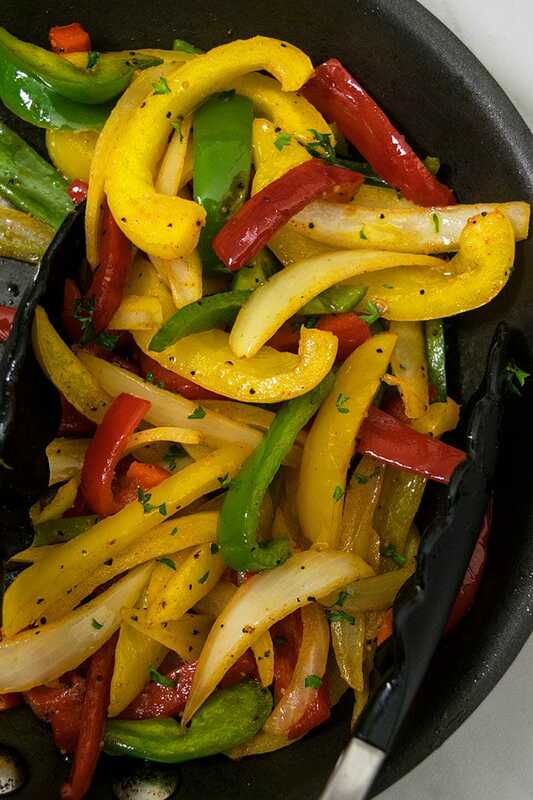 Quick and easy vegetable fajitas recipe, homemade with simple ingredients over stovetop. A Mexican 30 minute meal or side dish, great on tacos & burritos. Heat oil and butter in a nonstick pan over high heat. Add the garlic, onion, green pepper, red pepper, yellow pepper, orange pepper and cook stir fry until slightly charred but not fully burnt and still firm and tender. Add taco seasoning, salt, pepper and mix until veggies are fully coated. Turn off heat. Mix in cilantro and enjoy!